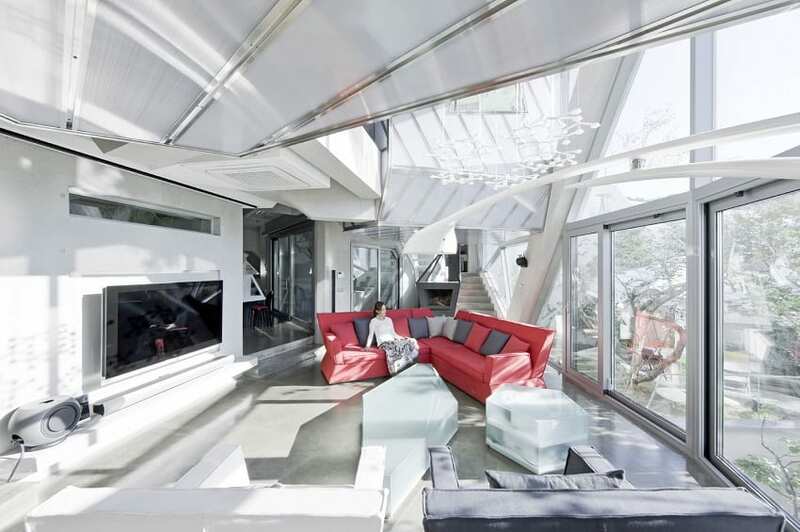 The Lusitania Paz de Colombia located in Medellin, Antioquia, Colombia, is a model of modern architecture. Lead architect, Camillo Avellaneda, explains the rationale behind the structural design. Lusitania Paz De Colombia is very much in keeping with these goals. Nestled in the curve of the hills on one side, and presenting a modern façade on the street side, this lovely building incorporates basic geometric shapes – circles and a rectangle – that blend with the local terrain and accommodates the climate. Environmental considerations were paramount in the design since it connects with a large park and is very near a major waterway. The building, which uses materials from Danpal, incorporates white and translucent façade, relieved by splashes of strong color. One of the unique attributes of the Danpal Façade System is its ability to admit natural lighting while diffusing it to admit natural light without glare and without excessive solar heat gain. 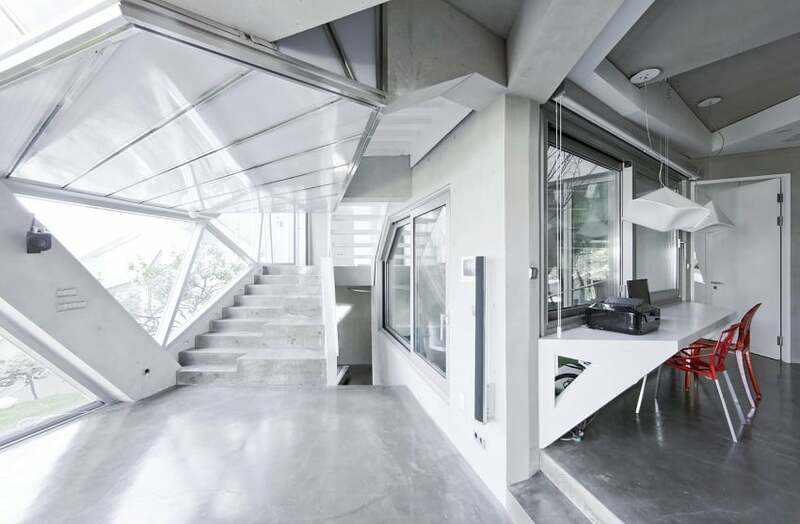 This allows architects to play with the way light behaves inside the building while providing shade against the strongest hours of sunlight. The rectangular classroom, which attaches to the top of a circular section that nestles into the natural curve of the hills, is shaded by a translucent shell with created of an open-work of geometrical shapes made from 16mm Danpal Opal Carbonate panels. Medellin is located near the equator where strong sunlight is a factor in architectural planning. The Danpal Façade System makes it possible to provide shading and the opportunity for breezeways without sacrificing natural lighting in classrooms. The central part of the building, a stack of three circular levels that house the administrative and instructor offices, the libraries and a laboratory preschool, is topped with a recreation area. A central well is drilled down through the circular layers of this structure and affords an open area for sheltered greenspace as well as an interior stairwell. Off-centered is another round structure that houses the auditorium and cafeteria. The playground can be approached from this side of the building or it can be accessed via a sweeping stair from the park side. A video, “Seguimos entregando mejores espacios para aprender” from the National Education Ministry shows a beautiful view of the completed building. It also features interviews with parents and children who are enjoying the new facility. The excitement on their faces leaves little doubt of the success of this beautifully designed learning space. 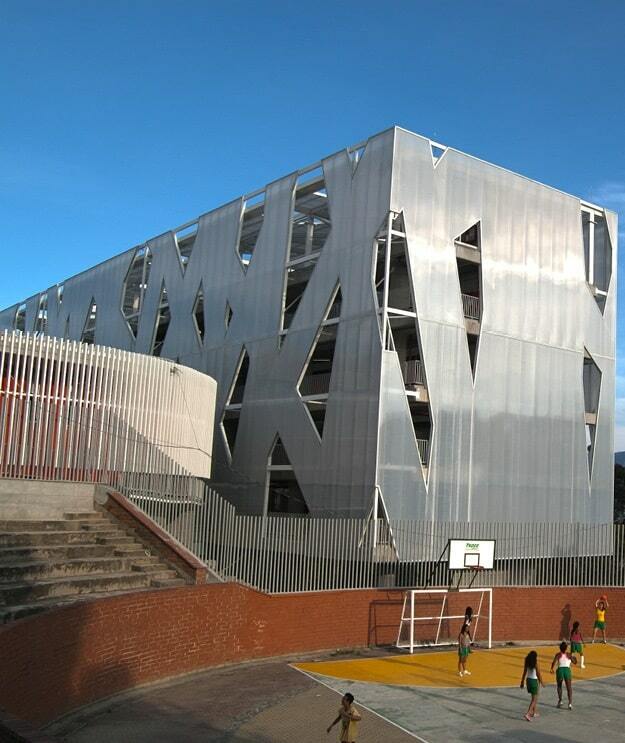 Colegio Lusitania Paz de Colombia is an example of architecture incorporates local geography with an advanced design to create efficient solar and thermal performance. The combination of polycarbonate and glass provides an inviting space for learning and for community activities. The school provides educational and cultural activities for hundreds of youngsters living in the city. The excitement the community feels about their building can be seen in the art work students have created to celebrate the school’s first year anniversary. The bright, diamond-like shapes of the façade are prominently featured in their drawings.